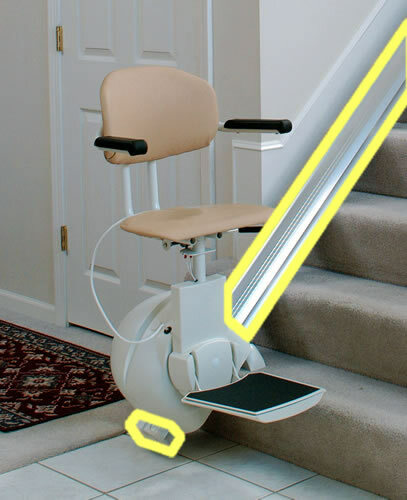 Stairlift Basics - What Is A Stair Lift? If you are new to the world of stair lifts, you probably have a lot of questions. There are a lot of new terms to learn and quite a lot of different information is out there. If you need help to understand it all, please start by reading this page. Even if you don't purchase anything from us, you will get the information you need to make right choice. We also have stairlift experts standing by, so feel free to call us at 1 (800) 791-6819 if you have questions about any product or feature discussed on our website. Or, if you'd prefer to contact us via email, click here. What is a stair lift? A stair lift is just a machine that moves you up and down your stairs. Some stores call them a "stair chair" because you basically are sitting in a chair. Other stores call them a "chair lift" because the chair you sit in is lifted up the stairs. 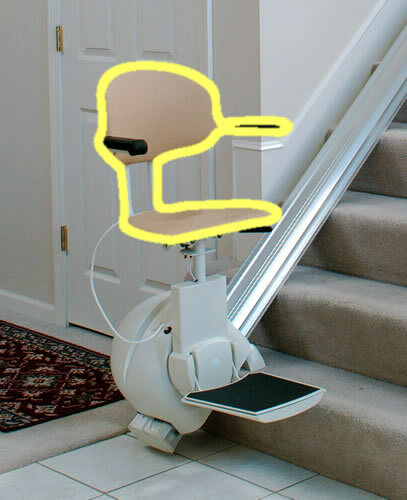 Wherever you go, a stair lift is a stair chair is a chair lift. We find that "stair lift" is the least confusing term. 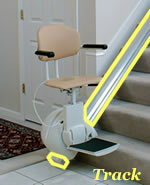 The basic parts of any stair lift are the track, the base, and the seat. Look at the images below to get a quick idea of where each part is located and then read below to find out more about what each part does. Track - The track is a metal rail installed on your stair case. The stair lift moves up and down on this track. Most tracks are made of aluminum because it is strong, lightweight, and won't rust. Base - This is what moves you. The motor refers to the motor itself, while the base refers to the motor and everything around the motor such as any electronics and their housing. Seat - The seat is attached to the base unit. 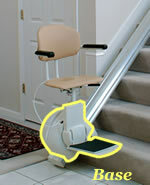 Some stair lifts have special footplates that allow you to sit or stand while using your stair lift. Safety devices - Different safety devices are used to ensure your safety and the safety of those around you. 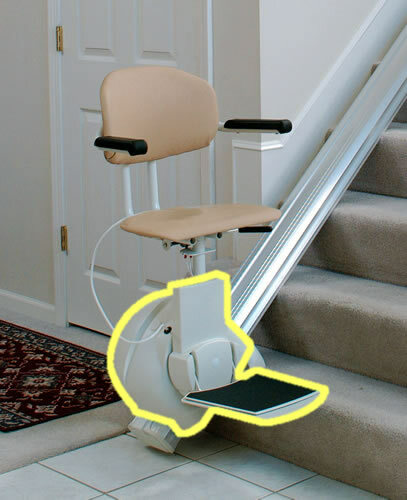 While they vary from manufacturer to manufacturer, your stair lift should have failsafes to prevent you from using the stair lift if you aren't properly seated or if there is an obstacle on the stairs, and to keep you safe in case of a motor failure. Call-Send Controls - These are remote controls that you use to "call" the stair lift to you or to "send" the stair lift to a person waiting at the other end of the stairs. This way you never have to worry about leaving the stair lift at the top or bottom of the stairs. Keyed Call-Send Controls - These are remote controls like the ones described above, but they require a key to operate. This is usually a requirement for stair lifts used in businesses or public places. Base Keylock - This is a lock on the base unit which prevents the stair lift from being used until it's unlocked with a key. This is another requirement for stair lifts in businesses or public places. Grocery Basket - This attaches next to your seat and lets you carry small items and packages with you as you use your stair lift. Cargo Rack - This takes the place of the seat on your stair lift and allows you to transport boxes, baskets, and other large items on your stair lift. This feature is particularly useful if you can climb or descend stairs competently, but don't feel safe using the stairs when you are carrying something.